Ganesh Chaturthi or Vinayak Chaturthi is one of the most auspicious Hindu festivals celebrated in India, especially Maharashtra, Goa and Karnataka. 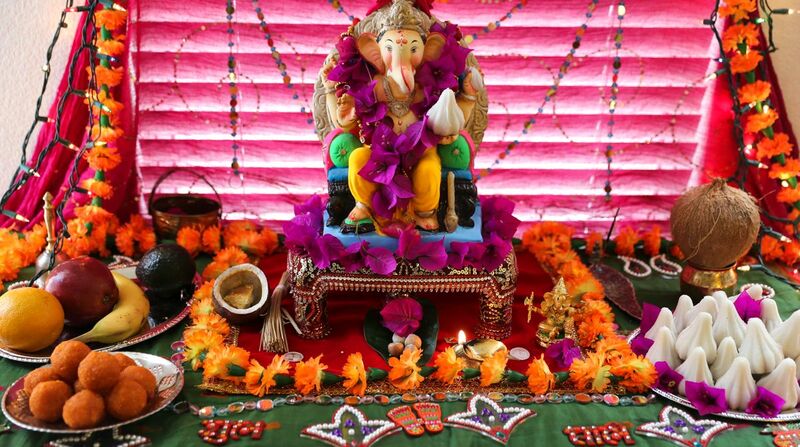 The ten-day festival begins on September 13 when most households install idols of Lord Ganesha and worship Him together with family and community members. Here are some Ganesh Chaturthi recipes by Chef Sanjeev Kapoor and Chef Sujeet Singh. 2. Add grated coconut, sugar, jiggery cardamom and pistachio. Mix thoroughly. 3. Cook till all moisture from the sugar and jiggery begins to dry. 4. It takes about 10 to 15 minutes for the mixture to dry on low flame. 5. Do not overcook as it will harden up and lose its taste. 6. Stir every 2 to 3 minutes till it turns golden yellow. 7. After the mixture is ready add malai (condensed milk to the mixture). 2. Add 1 tsp of ghee to the flour and mix it thoroughly. 3. Add 1 tsp of ghee in the boiling water. 4. Add the dough to the boiling water. Lower heat. Mix well. 5. Cover the vessel keep it for 5 minutes on low flame to let the rice cook. 6. Knead the dough into a smooth paste without lumps. 7. You need to knead it while it is still hot. You may apply some oil or ghee on your palms. 8. If you feel the dough looks dry and hard, add some hot water and continue to knead till the dough turns smooth. 1. Apply a pinch of oil/ghee on your palms and make small balls of the dough. 2. Flatten it to give it the shape of a katori or cone. 3. Press the edges of the katori-shaped dough with slight pressure at every 1-inch distance. 4. The edges of the katori will now look like the petals of the flower. 5. Put some stuffing in the katori and close the ends to give them a shape like fresh figs or momos. 6. Take a leaf of banana or a soft cloth like muslin, and apply bit oil/ghee on it and place it in the steamer pan. 7. Place all the modaks on the leaf or cloth and close the lid. 8. Steam it for 5 to 6 minutes and turn off the flame. 9. 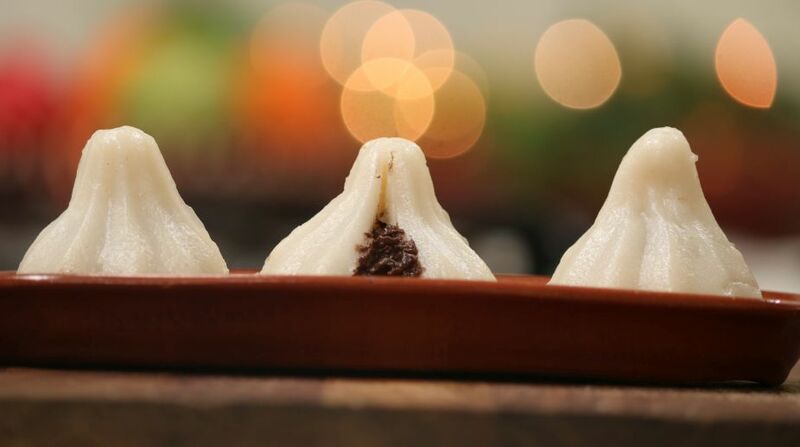 Your delicious modaks are ready to be served. 1. To prepare stuffing, heat cream in a non-stick pan and bring to boil. 2. Take chocolate in a bowl. Add hot cream and mix till chocolate melts. Add 1 teaspoon Nutralite Classic, coconut and mixed dry fruits and mix well. Refrigerate it. 3. Boil 1 cup water in another deep non-stick pan. Add salt and remaining Nutralite Classic and mix well. Add 1 cup rice flour and keep stirring got a minute. Sprinkle some water, mix, cover and cook on low heat for 2-3 minutes. Transfer the mixture on the worktop and mix using a spatula and knead into a smooth dough. 4. Dust the worktop with some rice flour and knead the dough well. Transfer in a bowl, cover with damp muslin cloth and set aside for 30 minutes. 5. Heat sufficient water in a deep non-stick pan. Place a steamer, cover and let it heat. 6. Divide the dough into equal portions. 7. 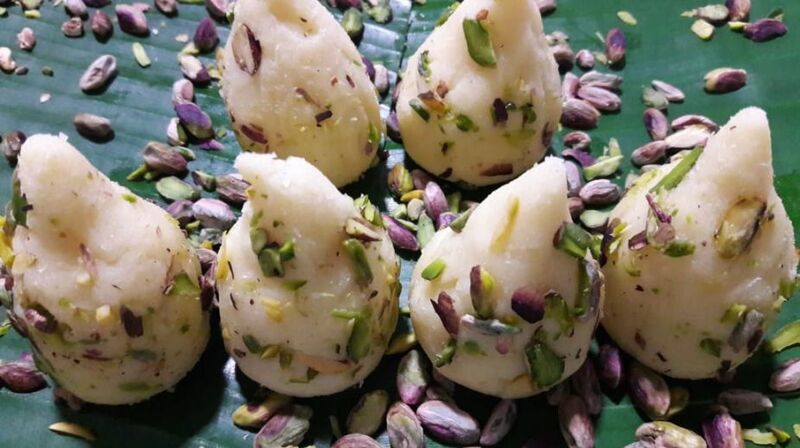 To prepare one modak, grease the inside of a modak mould, line it with a portion of dough, fill it with some chocolate stuffing, cover using some more dough, seal and demould. 8. Place the modaks in steamer, cover and steam for 10 minutes. 1. Grease an aluminium tray with Nutralite Classic. 2. Sauté the mawa in a non-stick pan with 1 tablespoon Nutralite Classic and on medium heat for five to six minutes. 3. Add the sugar and continue to sauté for five to six minutes more. 4. Add the walnut paste, green cardamom powder and sauté for two minutes. 5. 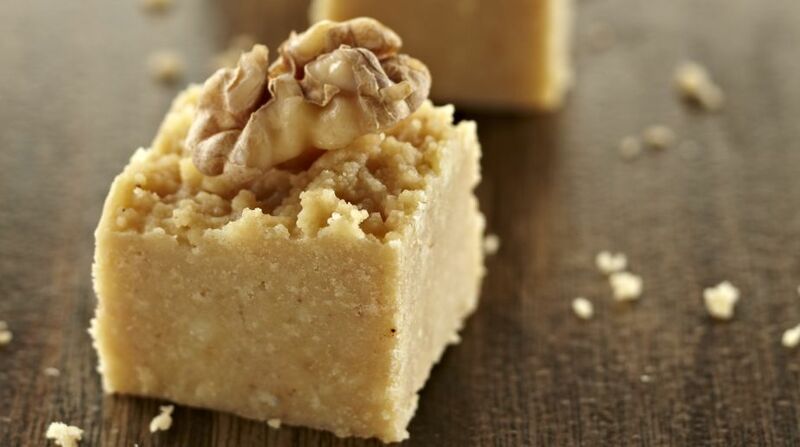 Spread the walnut mixture evenly on the greased tray and let it cool down to room temperature. 6. Cut into desired shapes and serve. 1. Dissolve the saffron in one tablespoon of warm water and set aside. 2. Heat Nutralite Classic in a non-stick pan; sauté the raisins and cashew nuts till lightly browned. Drain and set aside. In the same pan, add the rice and sauté for two to three minutes. 3. 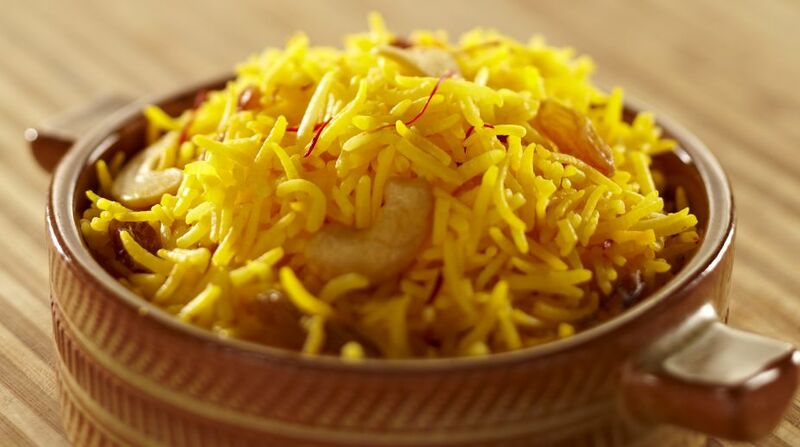 Add one and a half cups of boiling water along with saffron-flavoured water and let the rice cook. 4. When half done add the sugar and continue to cook till all the water has been absorbed and the rice is cooked. 5. Add the cardamom powder and mix gently. 6. 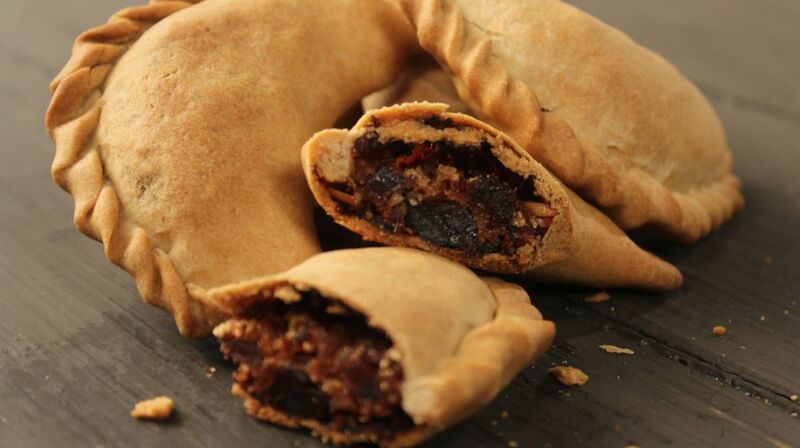 Decorate with raisins, cashew nuts and sugar crystals. Serve hot. fingertips till the mixture resembles breadcrumbs. Add one-fourth cup and one tablespoon of cold water and knead into a stiff dough. Cover with a piece of damp muslin and set aside for fifteen minutes. 2. For the filling, heat a non-stick pan; add the khoya and sauté for three minutes or till the fat separates. Set aside to cool. edges to seal. Pinch the edges to make a design. 5. Preheat the oven to 180 °C. Grease the baking tray with Nutralite Classic and brush some Nutralite Classic on gujiyas. 6. Bake in the preheated oven for 15-20 minutes.